Since the slides on the front of my LSS are starting to stick and the front rotors are nearly done (due to a pad-slap by the P.O. ), I've been looking into replacement parts combos for the front and I was very disappointed by the lack of pad options available locally (I try to buy brake/warranty parts local to 1) save on shipping, and 2) be able to make good use of the warranty ) and the only things available are the cheap, semi-metallics or Wagners. So, doing some digging, the "721" pad design from the 6/96-on dual piston calipers have WAY more options, but require a bracket swap due to the pad redesign (and actually better swept area). However, since the newer dual piston is also a dual slide pin (unlike the LSS, which has 1 slide, 1 anchor), the caliper has to match the bracket. But the hose only moves about 1/2" on the back of the caliper and the rotor diameter is the same (same rotor actually), and has the same piston bore (hence requiring the same fluid flow; no new MC or change in ABS/prop valve required), it should be a drop-on swap. I measured the CL of the bracket bolts @ 6-1/16". I'm waiting on an LSS bracket to come in tomorrow to measure to confirm the same spacing (it's too damn cold to be crawling around outside). Anyone else tried this? If it pans out, that means better pad selection and these calipers are normally stocked (remans) or are more readily available in JY (Legacies, Foresters and Imprezas used these guys as well). 1991 Legacy SSRS (BC) EJ20G (Full COP and AWIC Swap) // 5MT // White Pearl Tri-Coat Africa Rally replica in progress. It'll work fine with matching brackets and calipers. All Subaru front spindles have the same bolt spacing. What Alphius said. I've been running the newer front caliper design from the 02 WRX era cars since 2002. Thanks guys, and just confirmed today. Will work nicely. Or you can go bigger an put LGT fronts on with the H6 rears, But then 17's I believe is required. H6 rears fit 15" wheels, as do WRX front calipers if you do a little "grinding"
Never mind I reread your post mike Tracy, and yes that's true. When I need brakes again I'm going to do LGT fronts and H6 rears. Back when I thought my car was staying mechanically stock I put all new factory brakes on, but when it's time to change I'll go big since it's not really that much more money. 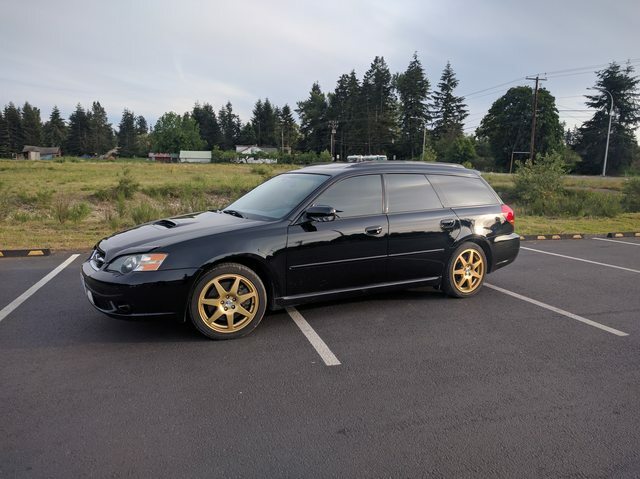 You might as well do the matching LGT rears. Same diameter as H6, but ventilated. Too much money for no benefit. Heat rejection is not a problem on a daily driver for me. It's way easier to find LGT fronts for cheap because of one little-known fact: Tribeca front calipers and brackets are the same thing. Much cheaper and easier to find. The H6 rears are easy to grab for cheap from a junkyard. It should be an excellent upgrade and I already run 17s so I'll be set. I have to disagree with the notion that 17" tires are overpriced. As the industry standard wheel size gets bigger and bigger, the prices on tires come down. I can get a Nexen CP671 tire in a 205/55-16 (which is the stock 02-05 WRX tire size) for $77.99. If I get the exact same Nexen CP671 tire in a 215/45-17 (which is the stock tire size for a 2006 WRX or a 2005 Legacy GT), I'll spend $100.08. It's a little more, yeah, but not what I would call overpriced. In fact, 14" tires are getting hard enough to come by that their prices are actually going up, to the point where they're nearly as expensive as 16" tires. You don't really get into stupid money for tires until you get into 20" or bigger, and even then, you can find those for around $130 or so each if you get off-brand Mickey Mouse tires. Back on topic, I've decided for sure on doing the LGT front brake upgrade to the B4. The fact that it has near stock STi performance with what amount to Outback front brakes has made itself evident one too many times for my liking.